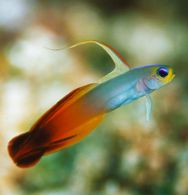 Damsel fish originate from around the world and are generally reef safe. 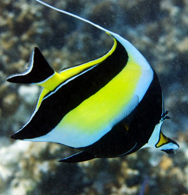 They are typically hardy and inexpensive, and often the first fish added when starting a new tank. Damsel fish are in the same family as clown fish and share their ability to enter anemones safely, but rarely do so except as juveniles. Scientific Names : Dascyllus trimaculatus. Temperament :Relatively aggressive and will only get more aggressive as it gets large. 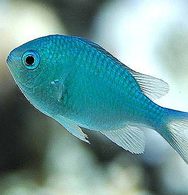 The Domino or Three Spot Damselfish is an extremely hardy fish found quite commonly in the pet trade. Very hardy and is often used to help start new aquariums kept by beginners.